The Equalizer Air Walker is an easily adjustable air walker that combines functionality and fit all into one comfortable product. It features a pneumatic air bladder system with cells on both sides of the ankle that inflate to move swelling away from the ankle and improve the overall fit. comfort after orthopedic surgery, and provides a better fit even for individuals with narrow feet. The bladders can be adjusted with the simple push button design for a premium fit. The Equalizer Air Walker has a low rocker bottom heal which helps make it easy to walk in, and large velcro straps that allow for quick and easy fitting adjustments. The wide sole enhances walking stability especially on ice or snow, and also reduces stress on both the knee and hip joints. The product is designed to keep your foot and lower leg fully immobilized using three velcro straps above the ankle and two across your forefoot. 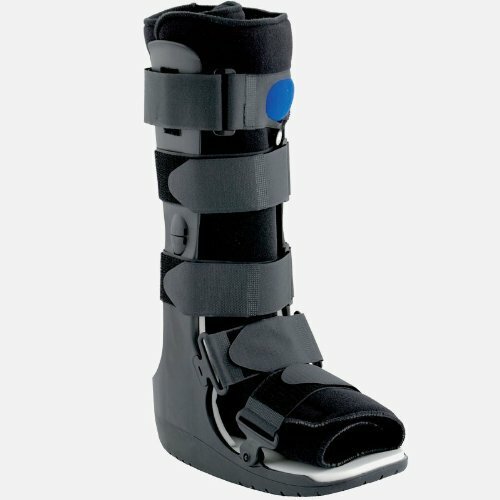 The product is perfect for ankle sprains, stable fractures of the foot and ankle, distal fibula fractures, and more. DME Direct only- Authentic product: Factory-direct from authorized distributor. Our guarantee: Genuine- not five year old product w/ old foam, glues, symbol and resins like the $42-$47 price version. Buyer beware!! Patented pneumatic air bladder system increases stability while decreasing pain and swelling. Inflation/deflation is easily adjustable with control valve on the front of the boot. Provides a customized fit for short or long term use.